If the word you want is not in the following list try the on-line glossaries at Flora of Australia or Missouri Botanic Gardens, Radford et al. Vascular Plant Systematics or the list of plant characteristics on the Virtual Field Herbarium site at Oxford University. Remember too that many of the words are illustrated in the images accompanying the various character states in the keys. adult  cf. juvenile; in many Solanaceous species the earlier foliage, or foliage arising from new shoots, may be larger, pricklier and more pubescent than that formed later; most measurements given here, unless specified, relate to the leaves found in the older stages associated with flowering. 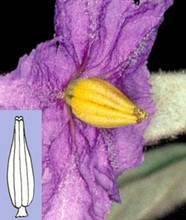 aestivation  the arrangements of the petal lobes in bud. 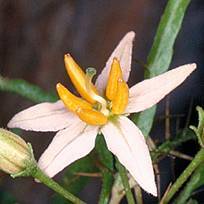 This character is particularly important in Solanaceae in deciding the relationships of the genera to each other e.g. tribe Anthocercideae is defined by its unique corolla aestivation. 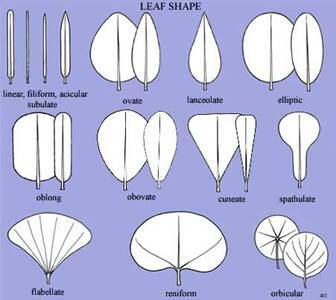 asymmetrical  not symmetrical; when used with respect to leaves of Solanum the bases of the leaf, either side of the petiole, meet the petiole at different levels (also referred to as oblique). bisexual (of flowers)  having both male and female parts present in the flower. Look for both stamens and styles in the open flower; fig. 19. cf. male flowers where the style will be absent, fig. 11.
cauline (of leaves in Nicotiana)  leaves along the upright stem, as opposed to basal leaves. 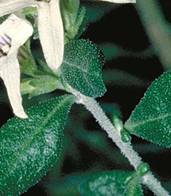 clammy  wet and cold feel, in Nicotiana due to presence of globular-headed hairs; fig. 21c. cleistogamous (flowers)  smaller than usual, often overlooked, flowers which never open; pollination is usually effected in bud and the flowers are all self-pollinated. Common in Nicotiana where it can lead to misleading measurements for the corolla length. clonal  reproducing by asexual means, usually suckering, so that the offspring are the same genetic makeup as the parent. 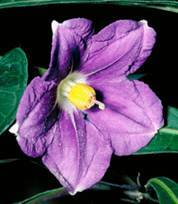 In many Solanaceae species new shoots arise from underground stems following disturbance. cyme - branched inflorescence (lacking a single axis) with each flower terminating an axis and subsequent flowers developing from the below the terminating flower; fig. 9.
decurrent (of leaves) - extending downwards beyond the point of insertion, e.g. in Nicotiana excelsior the leaf blade and petiole extend downwards to form a wing along the stem. Fig. 4. Decurrent leaves of N. excelsior. Reproduced with permission from Japan Tobacco Inc.from "The genus Nicotiana illustrated" (1994). dendritic (of hairs)  branched hairs in which new branches arise from different points along the main axis  tree-like; fig. 5. Fig. 5. Dendritic hairs of tribe Anthocercideae. Reproduced from fig. 4 of Haegi (unpubl. Ph.D. thesis). depressed (of shape) - flattened as if pressed from the top or end; wider than high. 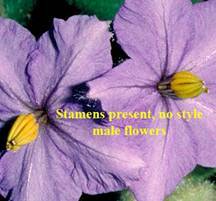 dioecious  male flowers and female flowers are produced on different plants  this appears not to be the case in Solanum where male flowers and bisexual flowers are produced on different plants. However the apparently bisexual flowers with their normal-appearing anthers produce inaperturate and non-germinating pollen and so these flowers are functionally female and the plants functionally dioecious; fig. 19.
discolorous  different colour on upper and lower surface, usually with respect to leaf surfaces; fig. 6. cf. concolorous. Fig. 6. Discolorous leaves  upper and lower leaf surfaces different colours. 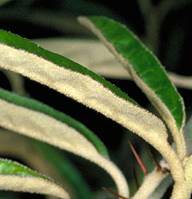 granular-tomentose  a specialised term used by Haegi to describe the appearance of hairs on leaves in some of the Anthocercideae e.g. Cyphanthera tasmanica, fig. 8. There is a general hair covering of branched hairs of even length interspersed with longer emergent branched hairs. hastate - spear-shaped - narrowing to apex but with two basal lobes. Such leaves are sometimes found in Solanum ferocissimum and S. chenopodinum; fig. 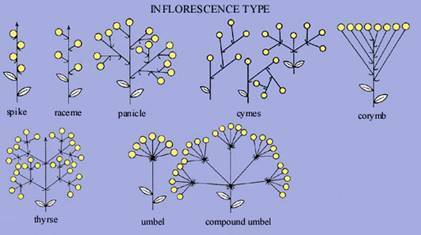 2.
inflorescence  arrangement of the flowers; see cymose, paniculate, sub-umbelliform, thyrse, umbelliform; fig. 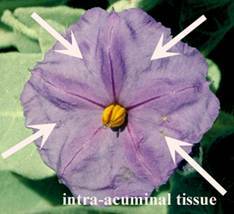 9.
intra-acuminal tissue in flower  tissue between the corolla lobes. Corolla lobes are usually of a slightly different colour to the intra-acuminal tissue, sometimes with a darker midline; fig. 10.
juvenile  early stage of plant life  in Solanum species in particular, but also in other members of the family, the juvenile stages are frequently different from the adult stage  juvenile or seedling stages often have larger leaves which are more deeply lobed and there may be prickles on the stems and leaves which disappear in the adult stage e.g. S. macoorai. lanceolate (of anthers, sometimes of leaf shape)  tapering to apex; all members of Solanum subg. Leptostemonum have such anthers; fig. 11. Fig. 11. Male flowers; styles lacking. mesocarp (of fruit) - fleshy portion of a succulent fruit, below the skin. monoecious - bisexual flowers, with a functioning style and stamens, are produced on the one plant; cf. dioecious and andromonoecious. 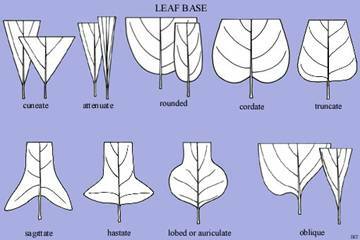 oblique (of leaf base) - asymmetrical, leaf bases either side of the midrib not meeting at the same point; fig. 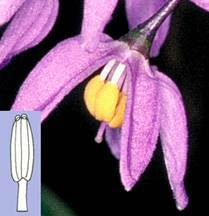 1 & 2.
oblong (of anthers)  straight-sided cf. lanceolate or tapering anthers of subg. 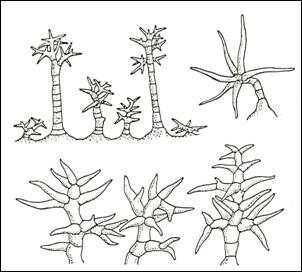 Leptostemonum; fig. 12.
obovate  ovate in outline, but attachment is at narrow end i.e. widest above middle; fig. 7.
orbicular  circular in outline; length to width 1:1; fig. 7.
ovate  egg-shaped in outline, widest in lower half cf. obovate; fig. 7.
panicle  much branched inflorescence, a compound raceme (a raceme of racemes); an indeterminate inflorescence in which the flowers are borne on branches of the main axis or on further branches of these see e.g. Duboisia myoporoides and fig. 9.
pentagonal  apex of the intra-acuminal tissue is more or less straight or cut off, giving a 5-sided appearance to the flower; figs 10 &15.
rotate  apex of the intra-acuminal tissue is rounded, giving an overall rounded appearance to the flower: fig. 14.
rotate-pentagonal - apex of the intra-acuminal tissue is straight, giving an overall 5-sided appearance to the flower: fig. 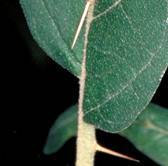 15.
simple (of hairs or inflorescences)  unbranched; fig. 21a. 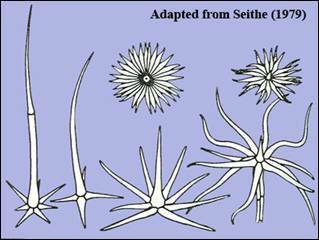 spike, spike-like - flowers arranged on a single axis, each flower sessile, oldest at base: fig. 9.
stellate (of flowers)  star-shaped (fig. 16). There is no, or very little, intra-acuminal tissue between the corolla lobes. The broadly stellate (fig. 17) condition occurs when there is some intra-acuminal tissue between the lobes but this is less than the lobes in height. Fig. 17. Broadly stellate flower. stellate (hairs)  star-shaped  hairs in which a number of arms all arise from a single point. For some of the various types of hairs which are scored as stellate see the image (fig. 18) adapted from Seithe (1979). Fig. 18. Stellate hair types in Solanum. Adapted from Seithe, A. (1979). 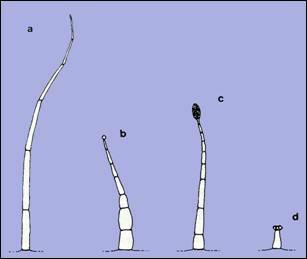 Hair types as taxonomic characters in Solanum. 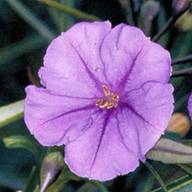 In: J.G.Hawkes, R.N.Lester & A.D.Skelding (eds), The Biology and Taxonomy of the Solanaceae pp. 30719. (Linnean Society of London: London). stone cells  hard concretions present in the fruits of some Solanum species  typical of subg. Archaesolanum (Kangaroo Apples) and also present in some species of the S. nigrum group, but absent elsewhere in Australian species; cf. sclerotic granules. stigma  area at the apex of the ovary and style which is receptive to pollen; the stigma may be capitate, obscurely lobed or distinctly two-lobed; fig. 19. Fig. 19. The presence of a style and stigma makes this a bisexual flower. 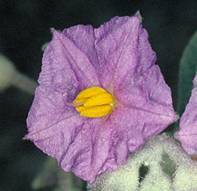 In some Solanum species of northern Australia such flowers may be functionally female since the pollen produced by the anthers is non-fertile. It is produced as a reward for visiting insects thus ensuring that pollination still occurs. sub-umbellate  inflorescence almost resembling an umbel  flowers all arising from more or less the same point and with the pedicels all of a similar length; fig. 9. Fig. 20. 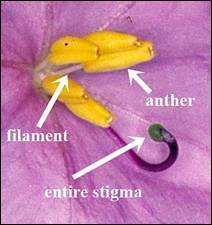 Parts of the Nicotiana flower. The arrowed portion represents the corolla tube. From Horton, J. Adelaide Botanic Garden 3: 3 (1981), fig. 2.
throat cup (with respect to Nicotiana corolla)  widened area immediately below the lobes in some Nicotiana species  usually the place where the anthers sit; fig. 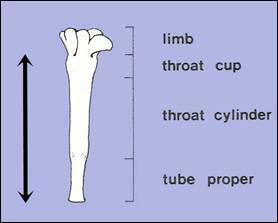 20.
throat cylinder (with respect to Nicotiana corolla)  widened tubular portion of the corolla tube, immediately above the tube proper and below the throat cup; fig. 20.
thyrse - a branched inflorescence in which the main axis is indeterminate and the lateral branches determinate in their growth (Flora of Australia glossary definition) fig. 9.
tube (of corolla)  joined portion of the corolla below the lobes; sometimes, as in Nicotiana, consisting of a narrow tube widening into the throat; fig 20.
umbelliform  resembling an umbel i.e. flowers all arising from a single point, the pedicels all of a similar length - arranged as in the spokes of an umbrella; fig. 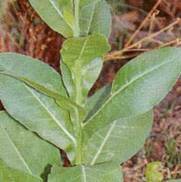 9.
wing - a thin flange of tissue extended beyond the normal outline of a stem or petiole; used in the description of the leaf petioles of Nicotiana species.